LADY BEE is offering 8 nights for price of 7 at 95,000 Euro with no delivery in Southern Italy region (Capri, Naples, Corsica). 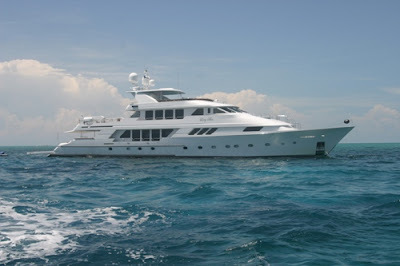 Accommodates 12 guests in 6 staterooms. Master is on-deck with full-beam and has king-size bed, his/her bathroom with central shower, W/C and Bidet. Full master entertainment center, settee. Further after is the Owner's Dressing Room with refrigerator and icemaker in the office. There are 5 guest staterooms, (4) with queen-sized beds and one with twin. All guest staterooms have ensuite head and showers. Full entertainment centers in each stateroom.